I am left-handed. That’s fairly uncommon. In fact, it’s one of the qualities that has always set me apart from others. Only 8 to 15 percent of the human population is left-handed, making the trait far less common than blue eyes and nearly as rare as red hair. Although on some days I would be just as pleased to write with my right hand if I could trade left-handedness for a head of red hair, most of the time it’s something I don’t even think about. Once I learned to write and how to deal with scissors, each their own awkward battles, it was rarely an issue. One of the few times it did come up was when I was about ten years old. I took a crocheting class at our local 4-H chapter, and because our chapter was so small, my mother was conscripted to teach the class (consisting of me). 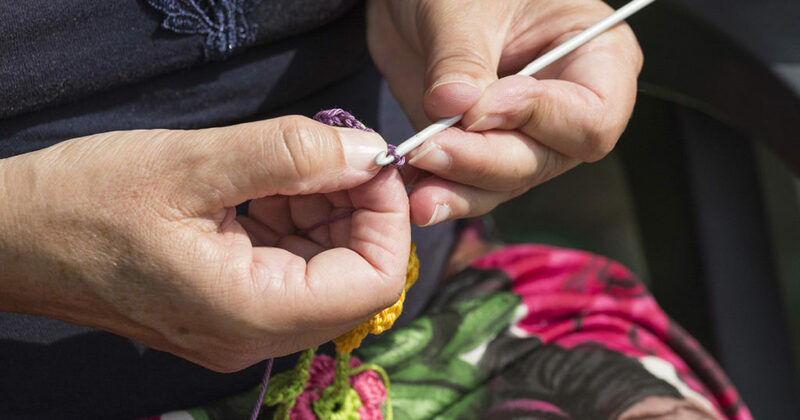 She didn’t know much about crocheting—just how to chain, single crochet, double crochet, how to increase, decrease, and make a shell stitch—but she undertook the task with determination. My mother is right-handed like everyone else in my family, and the question of how to teach her left-handed daughter posed a bit of a puzzle. After a few failed attempts, she hit on the plan that brought us success. 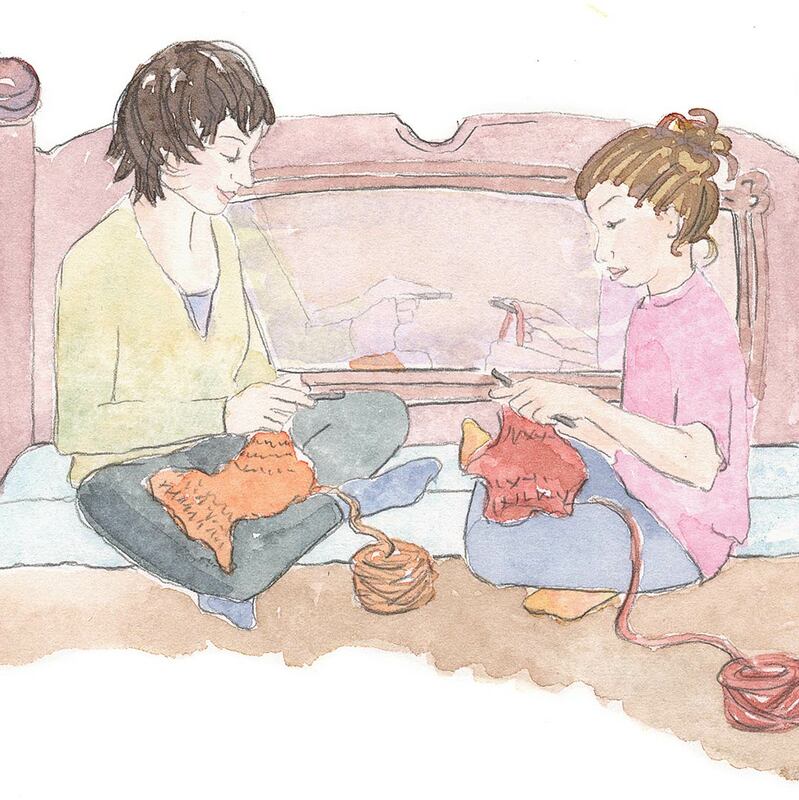 We sat together on her bed with our hooks and yarn, and I watched her movements reflected in the mirrored headboard as she formed her stitches. That was all it took! Soon I was cranking out yards of chain stitches and rectangles of various sizes. My mother doesn’t use patterns, so she didn’t teach me to follow them. She taught me how to shape the stitches and told me to make pieces the shape and size I needed for what I wanted. I soon progressed from pot holders to more ambitious projects, even saving my allowance to buy an undressed fifteen-inch doll (affiliate link) to make clothes for. It was not long before that doll had the most amazing wardrobe, complete with dresses, blankets, a bulky purple coat, and a white purse, all made from acrylic yarn (affiliate link) scrounged from my mother’s stash. I still remember taking that doll, dressed in a lumpy, mint-green dress with one asymmetrical strap and a frilly skirt, to the fair in the summer. I was so proud of that dress, but the judge was not impressed—until she learned that I hadn’t followed a pattern, a fact that earned me a blue ribbon. I noticed that my crocheting didn’t look as nice as my mother’s nor as smooth and professional as the other pieces I saw at the fair. At first I chalked it up to my inexperience, but as I got better and faster and my work stayed lumpy and “wrong looking,” I decided it must be because I was left-handed. It was an easy answer and explained to my satisfaction why my finished crochet looked different than everyone else’s. It wasn’t wrong; it was different, and that was that. As I got older, I gradually stopped crocheting. I gave my doll to my little sister and forgot hook and yarn amidst the homework and chaos of high school. It wasn’t until after I married that I revived the skill, partly to pass the time and partly because I wanted to make baby things—something that few can resist. Feeling rather daring, I followed my first pattern out of an old booklet purloined from my mother’s shelf. The hat turned out comically large; I knew nothing about gauge, but I was encouraged enough to keep going. No one I knew crocheted, so I turned to the Internet for more patterns and design inspiration. While scanning the directions for a pattern one day, I had a revelation. The pattern specifically directed that some of the stitches should be made through the back loop only. I was making all of my stitches through the back loop only. Suddenly suspicious, I scoured the Web for basic crochet tutorials with photos. Sure enough, another mistake: I was holding my yarn in front of my work, inserting my hook into the back of my stitches, and pulling loops through from the front to the back. 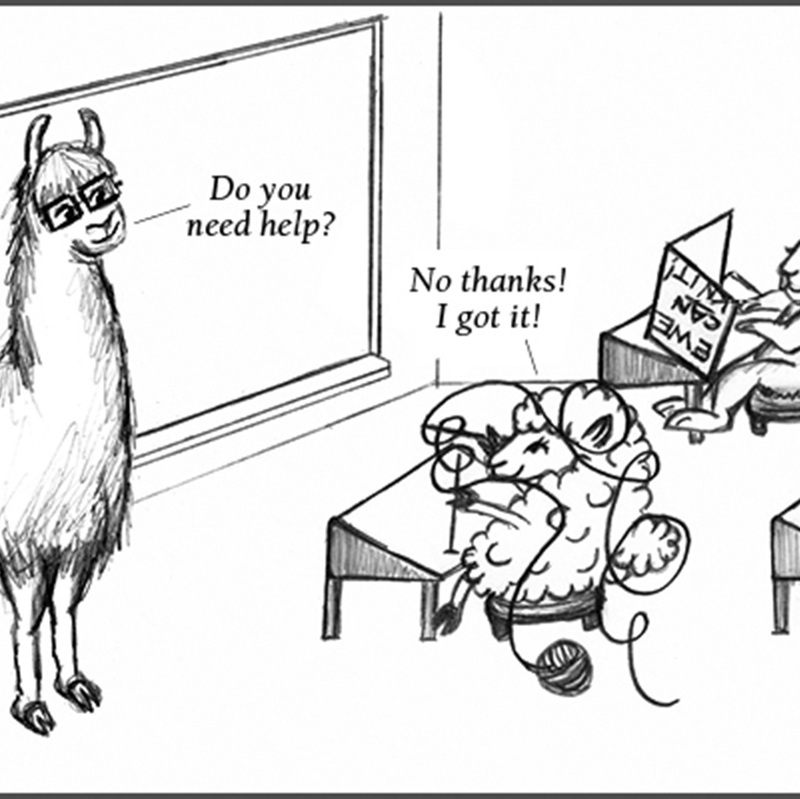 Since then, I’ve had several people comment that it must have been terribly difficult to work with the yarn in front, but I had become expert at doing nearly the opposite of what I was supposed to be doing. I can relate. Although I’m a righty, last year I decided to switch to knitting for awhile. I hadn’t really pursued knitting since I was a teen because crocheting was easier for me (only on loop to risk losing!). After knitting several small projects and interested rnoughto learn more, I started watching video tutorials. When the topic of twisted stitches came up and which way to wrap the yarn around the needle, sister what a surprise. All my stitches were twisted. After hours af concentrated practice, I can now knit properly and my results are smooth and even. Now that I’m switching back to crochet, I’ll be watching video tutorials to see if my crocheting is my way or the right way! The dilemma of being left-handed. My mother also tried to teach me to crochet, with little luck. I think I stopped at chain stitches as a child, finally mastered SC & DC in my teens. My real break through came with the internet and videos on YouTube. I could watch over and over again, repeat the movements in my way, head on. I learned to mimic the movements in reverse. Then came the left handed versions of project and I’m so used to translating the pattern, I can’t comprehend them, but like most of us lefties, I found my way. We are an independent lot. I’m a fellow leftie and also learned crochet by sitting across from my mother and mirroring her moves. Luckily I didn’t go through the same trials and tribulations. I recently taught a beaded crochet class, and used a modern version of that trick. I took pictures of myself at various points in the process and flipped them with photo processing. Voila! I was able to hand out instructions with right-handed pictures. I guess I do that mirroring thing a lot because now I can just watch an online “rightie” video and flip it in my head. I’m a left-handed crocheter. I learned watching my mother when I was nine. I did everything she did, just in reverse. My items come out beautifully, and I follow instructions without reversing anything. I’ve never had a problem, and I don’t have to flip patterns to make them appear any differently. I’m a big crafter – sewing, crochet, needlepoint, embroidery, painting, cross-stitch, candles, etc., and I’ve never encountered problems in my work. I guess I’ve been lucky. My red-headed, blue-eyed lefty learned to crochet early and taught me to knit before she finished high school. She is an expert on finding online tutorials; her first knitting project was a beaded lace scarf because it was pretty. It was. Being left-handed is only a handicap if your think it is. As with many of you my mother tried to teach me to crochet but as a lefty we never could quite get there. I took crocheting back up when I was pregnant with my first child. So as a self starter I don’t hold my hook in the traditional manner but my mother has told me my tension is much better than hers. Go lefties! I’m left handed, but learned to crochet right handed, as I had better tension control with my left hand. However, left handed scissors have been a revelation, go get yourself some!